I'm out of touch with trends, and my style takes more inspiration from Apgujeong halmeonis than Hadids, so I'm embracing my inner grandma to aggregate advice for updating a wardrobe from college to the corporate world. I interned for ELLE first semester of freshman year, and worked throughout school, so my college wardrobe was a little different from the North Face + Uggs formula of my classmates. I lived off campus and would frequently go straight to work from class, making rolling out of bed in pajamas not an option. My mom, who completed undergrad with two kids under four, then finished law school while raising three kids alone, never went to class without full makeup and dressing nicely. This made me uncomfortable about wearing sweats to school, considering I didn't even have cats to care for until junior year. Parisians, correct me if I'm wrong, but based on the throngs of kids I wade through everyday, it seems like neither lycée nor university students dress super casually? Even 12-year-olds wear either blazers and cashmere sweaters, or off-duty model looks, to Chipotle. For the sake of simplicity, I'm generalizing observations below, operating on the assumption that nearly all new grads have a limited budget to start with, and, by extension, limited storage space. Depending on your office dress code, what your style is, and what you do in your free time, you may be able to re-use workwear items for off duty, stretching your budget considerably. For instance, the Paris Vogue uniform of slim trousers, oversized tops, pencil skirts, tailored jackets, and comfortable shoes is typically appropriate for office and weekend, yields plenty of year-round outfit combinations, and doesn't necessarily cost much. My life experience is still limited, so this advice won't apply to every working environment. Please share what you've found helpful in your case! K. Jacques-type or gladiator sandals and espadrilles, especially ribbon tie wedges, are widely accepted here. If they're not at your company, peep toes, Vara-style pumps, or Minnetonka / Everlane / Tod's type driving shoes are comfortable for warmer weather- the key is finding breathable, natural materials. When I worked in a lab, open-toed shoes were out. $20 Newbark flats from eBay (with a rubber sole the cobbler added for $12) were my favorite all purpose footwear because they covered the whole foot, looked nice with dresses, and were comfortable to commute and stand all day in, but light enough to not get sweaty. It's harder and can be more expensive to find a good fitted dress than a sleeveless sheath or shift, which, when cut above the knee, reigns supreme in Paris, with a leather jacket or tailored blazer. Some of your co-workers may find fitted styles overly dressy, or you may not be comfortable wearing one all day, so the latter may be preferable. Obviously, I almost exclusively wear dresses (in the lab, we could wear below the knee skirts), because suits are expensive and don't fit me right. My superiors cited this as a reason for promotions or good performance reviews! They thought my appearance was respectful and showed I took the job seriously. Because women hardly wear skirts now, they can potentially set you apart and make you memorable. Whatever skirt or dress you choose, it's better to skim the body than hug it. Longer-lasting, less informal, and versatile enough for off duty, these are some of the easiest things to buy at a thrift store, although Eileen Fisher, Reformation and Everlane have good offerings. Usually, the armholes are cut wide enough to avoid armpits entirely, making them easy to maintain and hand-wash, assuming new grads don't have time for or ready access to laundry. Silk and linen are better smoothed by hand, require little to no ironing, and are every bit as comfortable as that ubiquitous Forever21 synthetic cami, minus the constantly unraveling seams. upgrade to a grown-up bag and knee-high or ankle boots. In my strictest workwear environment, they didn't allow over-the-knee boots. Flat riding boots lined in cushy flannel and low-heeled leather zip-ups were office-appropriate and just as comfy. To me, a secondhand Longchamp bag is the lightest and best-priced way to carry your laptop, papers, lunch, and extra pair of shoes without killing your shoulders, but there are plenty of ethical leather and vegan options. Taylor Swift is an excellent example of how shorts can look sophisticated and office appropriate. Keep your cutoffs for Burning Man or washing your car, but if there's any chance you might run into a coworker or manager on weekends, you may wish to swap in something more grown-up. Since shorts are now generally accepted in all but conservative offices, here's a helpful post for making them work on the job. Lined wool tab front pants, in my experience, are just as comfortable as sweats and better for warm weather. I found mine at thrift stores and shortened them for a few dollars; easy to pack and hand-wash and naturally wrinkle-resistant, I could steam them in the shower to save on dry cleaning. A wool coat and decent trench for rain are warmer and more breathable than fleece or a hoodie. Thanks to the wonders of the internet, you can find ethical / secondhand options that won't break the bank. It helps that parkas are increasingly acceptable these days. Sweaters are as comfortable as hoodies, but more useful. Handknit isn't always the best for offices and is more cost-prohibitive. Instead, choose a lightweight wool or alpaca to layer under jackets, perfect for hot, crowded Métro rides and generally suited for year-round wear. Mine is a J Crew cashmere sweater in Heather Acorn, $18 at Clothes Mentor. Just don't make the mistake I did and keep buying frumpy cardigans (if I get cold, the pullover looks better over dresses). Looser, thicker, with longer sleeves and more refined seams, Geraldine Saglio and Barbara Martelo have perhaps the best collection of office-appropriate t-shirts. Currently, I'm wearing a linen secondhand Etoile Isabel Marant Keiran, my black split sleeve cotton shirt, and thrifted Madewell cotton v-neck. Marinières are good, though I don't see many wearing the jersey kind in offices here. I once worked in an office where we couldn't wear t-shirts, so I wore Equipment shirts over camisoles, woven wool tops, and tunics. Most people look nice in an oxford (Emmanuelle Alt wears American Apparel ones), but I didn't want to deal with the ironing. Now I wear Etoile Isabel Marant's plaid-linen Tom shirt with my skirt or dark jeans and pumps / espadrilles (BTW I decided against a leather jacket. I tried one and with this plaid shirt I looked like Jamie Hince). I had to sew the back seam down because it made a weird bubble in the back, but it doesn't wrinkle and looks as nice in a corporate setting as at Freegan Pony. Reformation's Lina top is another low-maintenance option. Unless you work in a creative industry where Vetements-style jeans are acceptable, a good pair of dark rinse skinnies / bootcuts will work wonders. I don't know why I hung on to my flares so long, because skinny jeans, cut at the ankle, look more professional. I like J Brand Photoready 811, which are floating around eBay for cheap (mine are Bluebird wash, $7, and needed no tailoring). Katie Holmes wore them so you know they're conservative, but the Kardashians also wore them, so you know they can party. With a thrifted cashmere v-neck and pumps, they're perfect for a day at the office and drinks at a Paris speakeasy after. On a tight budget, fast fashion can be tempting, but in case ethical implications aren't enough to trump price, remember the clothes require more maintenance and cost more in the long run. Some argue you can still get years of wear from fast fashion, although it takes more mending, fixing hems, sewing buttons back on, repairing heels, etc. It's all about balance- minimizing mistake buys and buying when you're absolutely sure an item is quality and you'll love wearing it five+ days a week. Thrift stores are usually a good place to experiment with lots of different styles, instead of select trends marketers, retailers, and merchandisers choose for you. Now that the secondhand market is more selective and conscious about what styles / brands they take, that may not be true of all stores. When I first started working, I put more money into shoes and lingerie- they are the basis for everything (finding supportive bras that are invisible under clothes is surprisingly difficult). I wore a dress and good shoes to job interviews instead of a suit, and recruiters always remembered me. Invest in a nice coat next, because that's the first thing you're seen in, then jeans because they're a workhorse, and a good pair of jeans gives confidence (did Carine Roitfeld say that or something? I feel like I'm plagiarizing this). Also, tops normally don't last as long as bottoms or jackets, which last years with proper care, so budget accordingly. You don't need a different outfit for each day of the year or day of the week- in most industries, it's probably best to be seen in the same outfit more than once, even if you're constantly photographed or in the public eye. The perfect work wardrobe depends on color and quality, things that look better the more they're worn. For instance, my sister (an accountant for a major US company, who has to travel for work) relies on a formula of colorful wrap dresses, neutral button-downs and tunics, bootcut trousers and pops of pastel, all things that don't wrinkle easily, remain comfortable, and will withstand the test of time (I think she buys a lot online and gets high-quality statement pieces from Korea). Invincible Summer is another example of an office-and-age-appropriate wardrobe. In most offices, prints are ok if they're classic. Leopard works with everything, and horizontal stripes generally don't look dated. Vertical stripes and some florals can look like Rachel from Friends, while certain plaids look very Cher and Dionne at the beginning of Clueless. There are exceptions to everything, and it's best to adapt to the unique culture of your workplace, erring on the conservative side, if necessary. Lastly, most of this still applies if you work at home. You're still a professional! Sweats and pajamas just don't seem conducive to productivity. You don't have to go all out, but a nice button down or jumper and combed hair are more polished, in case you have to leave the house or unexpectedly meet a client for some reason. Great tips here! I love that in Paris you seem to be able to dress somewhat more casually at work. Clothes shopping is almost impossible for me — I have a conservative profession, travel to weird places for work, am an odd shape to fit, and I'm picky about style, colour, fabric, ethics, and so on. Seven years after I left uni, I still haven't "figured out" my wardrobe, and I can't figure out if this is a post-college transition that went on WAY too long — I miss my jeans — or if it's just part of the sameiness of a very conservative profession. Oooh traveling to weird places for work sounds interesting though! I think it takes time. Especially if you have strong values for ethics and fabrics etc. Don't settle! I know you will find great pieces. Can you shop when you travel for work or is there just no time? 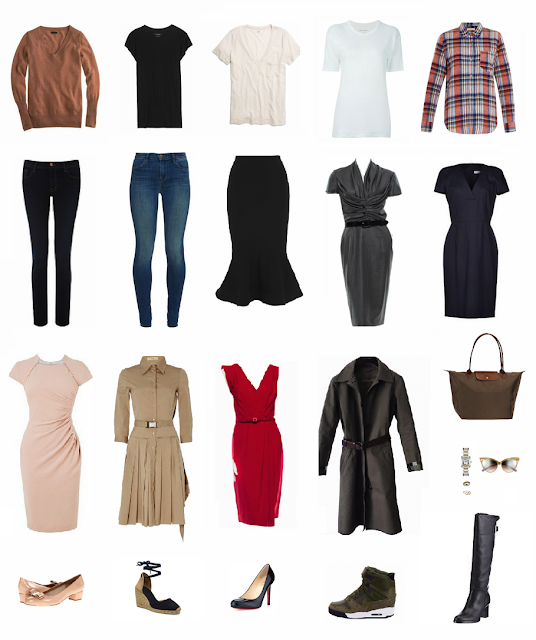 Do you have an easier time shopping for weekend clothes or is it the same problem? I try not to settle, although sometimes settling for bad clothes is better than settling for going naked. :) By weird places, I mean more remote parts of the Middle East. I could buy clothes there, but women usually wear religious/cultural clothes. It would feel odd to me to wear them — almost rude or disrespectful — although I have picked up an extraordinary amount of beautiful scarves this way. Lots of the guys wear safari-style linen suits when we're abroad, which I also find distasteful — we're based in London, so it looks weirdly colonial to me. Like I said, I'm super picky! I've been snooping on your wardrobe for a while now, and I absolutely love your approach. I'm hoping to get more of it! It seems like you've spent years working to get here though, is that correct? Your job is even more intriguing now! But that does seem incredibly difficult to dress for, and safari suits do sound colonial, no matter where a company is based. I was under the impression that in many Middle Eastern cities, the people are fashion conscious even if they're covered up so I agree that (maybe I'm off base with this) even if someone is traveling to rural areas, that kind of suit sounds a little demeaning... I'm just picturing Rudyard Kipling or Indiana Jones too much. I'm really curious to hear what solutions you come up with. And thank you, you're correct, it's taken me years! Basically since I moved here I've been trying to figure this out because my lifestyle is so different now compared to where I was living, and my body is different too. http://www.vanityfair.com/style/photos/2016/04/kate-middleton-india-tour-fashion-photos I adore the concept here and the sentiment is helping me pack for a trip to several more conservative lands. The execution seems somewhat colonial as well. Ok, this is reassuring for me! You look great now! Glad we had the same ideas. Castaner espadrilles are the only ones I can find like that, I think, without going to south of France, and they are too narrow and very expensive. This is another great post Ariana. I recently converted to a large grey Longchamp (Le Pliage) and it works really well as a work/travel bag ~ the grey hides dirt and shifts seasons well. It is a serious improvement over the backpack I have carried for7 years (embarrassing!). On another note, your hair looks wonderful in that photo! H2O only washing has given you a glorious mane! Hi Rachel! Thank you so much. The grey Pliage is sooo beautiful. Good choice! I'm so glad you like it. It's great that they've continued their quality over many seasons when other brands decline. And thank you about the hair, that just made my day! That photo should never be on any blog but because I liked my hair I thought, "I need to work that into a post," lol! I always love your wardrobe posts. So good to get an inside sneak peek at how someone else approaches minimal wardrobes, being stylish in all situations, and purchasing quality items with care. Thanks, Ariana. Love the update! Seems you have fewer clothes every time I check. I need to work on downshifting more!! Thank you for keeping us updated and sharp. Love! It's very light, easy to clean and isn't killing my back. P.S. I started reading Elegance, but didn't finish it yet:) I have a tendency to read a bunch of books at the same time. Most of her tips are great, it was just a little hard to relate to, because I am neither petite nor slender. I am more of a larger hour glass type. I found some of her tips a bit outdated, but for the most part she is right on the money about what is and isn't elegant. Hi Alina! The things is, a lot of people look really cute in cardigans! Just not me. I'm so happy you like the Pliage! Great color too. You definitely have to laugh a little at the advice from the 1960s, but I think the principles behind them are still solid. I never thought about it, but you are right, she definitely writes more from the standpoint of being petite. She basically says, "Tall girls can wear whatever they want, but here are rules for people my size."